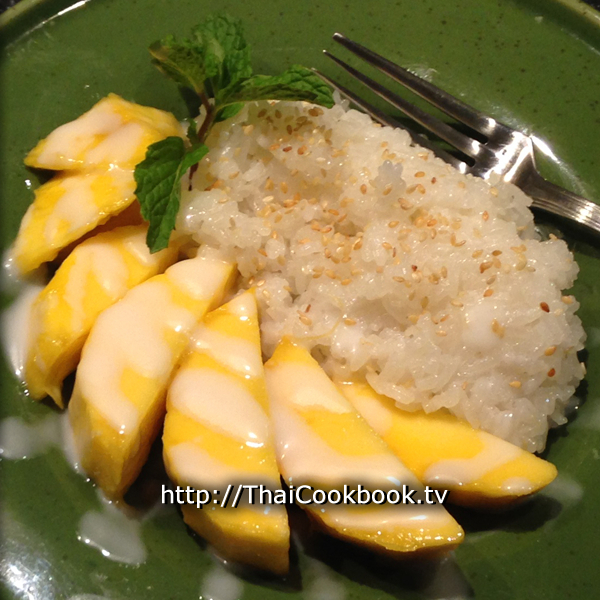 Mango with coconut sweetened sticky rice, known as Khao Neow Mamuang (ข้าวเหนียวมะม่วง) in Thai, is perhaps one of Thailand's most well known desserts or sweet snacks. The sweet and juicy, delicious flavor of well-ripened mango, next to the soft but chewy sticky rice that has soaked up the creamy and subtle flavors of coconut, which has been topped with a sweet but also slightly salty coconut milk topping, all with a sprinkling of toasted sesame seeds that give a burst of flavor as they pop between your teeth. There's really nothing quite like it. Making this lovely dessert at home is easier than you might think, and it is guaranteed to be a hit at your next dinner party. 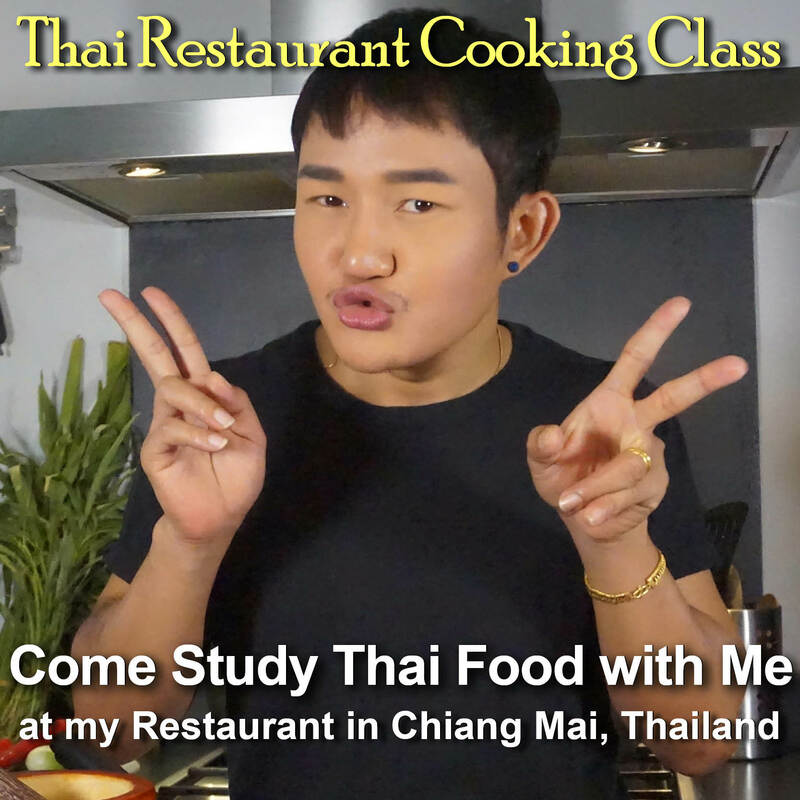 Follow along as we show you the complete process, including making perfect sticky rice on your stove top. 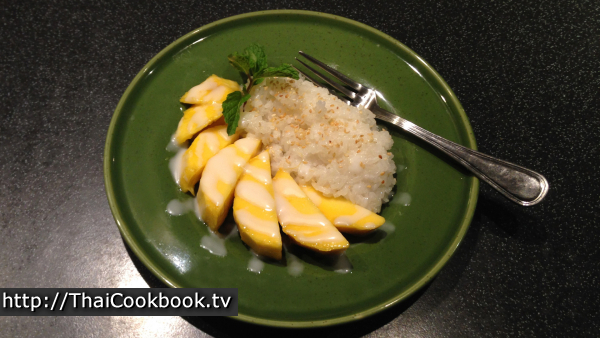 What's in our Mango with Sticky Rice. How we make our Mango with Sticky Rice. 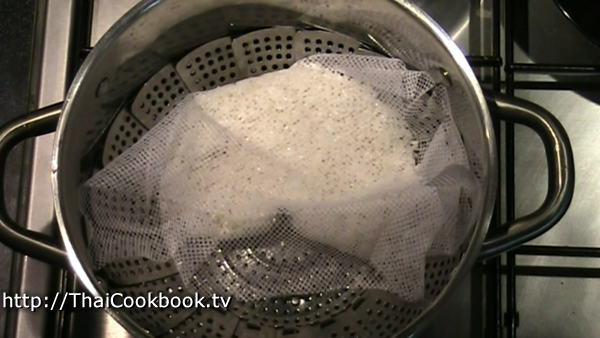 1) Prepare the sticky rice by steaming glutinous rice inside a cloth bag using a vegetable steamer. 2) In a small saucepan, stir 1 cup of coconut milk together with 3 tablespoons of sugar and 1/2 teaspoon of salt. Heat only until the sugar and salt dissolves. Soak the cooked sticky rice in this mixture. 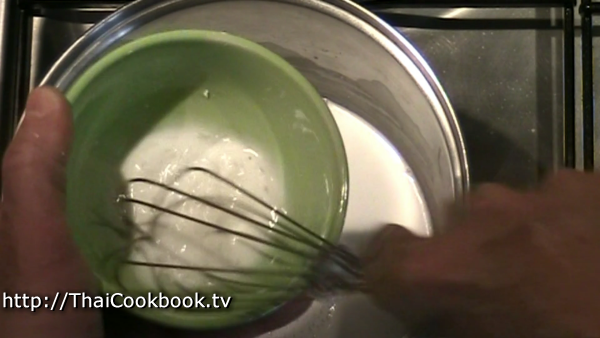 3) Blend the 1/2 cup coconut milk, salt, sugar and starch. Whisk and heat in a small pan until thickened, then cool in the refrigerator until ready to serve. 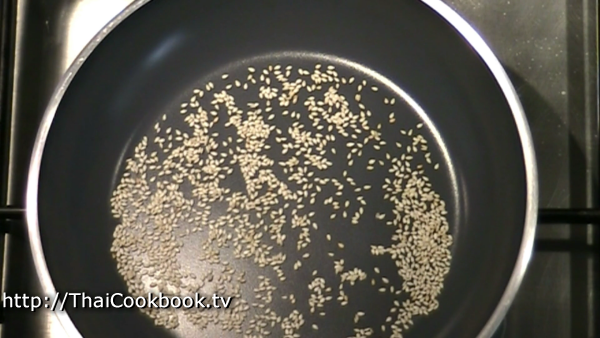 4) Use a small flat pan to toast the sesame seeds until golden brown. 5) Peel and cut the mango and arrange it with the sweetened rice. Sprinkle the rice with a little toasted sesame seed. Drizzle a little of the very cold sauce over it all. Serve. 4 hours before you start cooking, soak the glutinous rice in a generous amount of water. Then, drain it and rinse well. 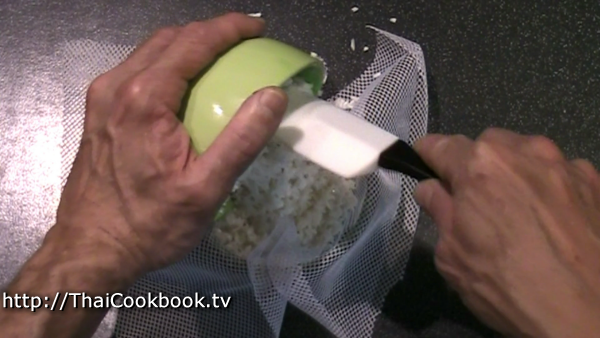 Place the rice in a piece of cheesecloth. Lay the rice in your vegetable steamer. Keep the water level low enough so that when it boils it is not coming up onto the rice. Steam the rice for 20 minutes, then check it. It should be soft, sticky and translucent when done. If it is still dry or hard, then continue steaming for a while longer. For the most delicious mango with sticky rice, use the mangoes from Thailand that are called Mamuang Nam Dok Maai (flower nectar mango) . They are long and slender and have very yellow skin even when not fully ripened. Be sure you get very ripe mangoes. If you can't get this type, then be sure to use mangoes that are ripe and yellow inside, and not the type that are normally eaten when green. 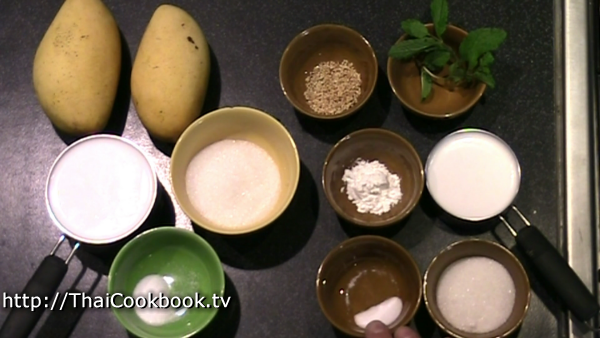 While the rice is steaming, measure and arrange the ingredients. 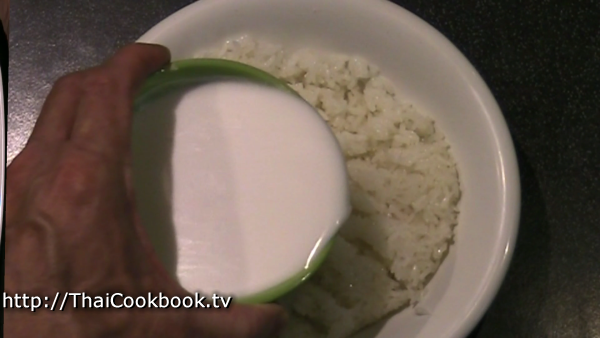 You'll be making a sweetened coconut milk that's used to soak the cooked rice in. 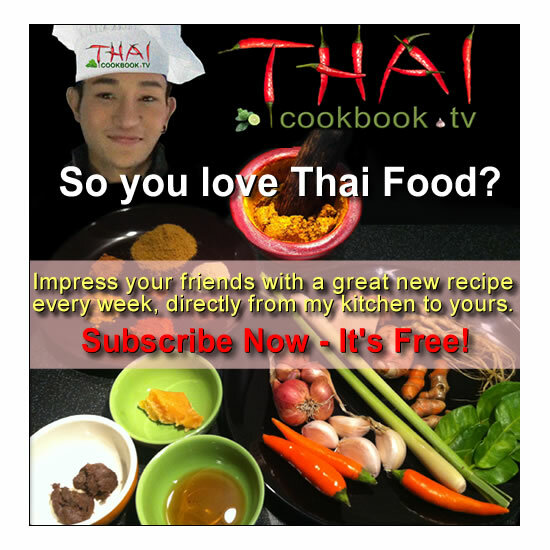 It is 1 cup of coconut milk, 3 tablespoons of sugar, and 1/2 teaspoon of salt. You also be making a thicker coconut topping that uses 1/2 cup of coconut milk, 3 teaspoons of sugar, 1/4 teaspoon of salt, and 1 teaspoon of starch. You need 1 teaspoon of white sesame seeds, and a sprig of mint as a garnish (optional). In a small saucepan, stir 1 cup of coconut milk together with 3 tablespoons of sugar and 1/2 teaspoon of salt. Heat only until the sugar and salt dissolves. Do not boil. By now the rice should be done and still very hot. Lay it in a shallow boil and spread it around. Do not flatten it like a pancake, but use a spatula to make creases and open areas. Loosen it up so there is air and place for the coconut milk to settle in and pool up. Poor the sweetened coconut into the rice. Just use enough so that it starts to puddle. The rice will soak up a lot of the liquid after a while, but you don't want the rice to be wet. You can do a little now, then check it later to see if it can take more. 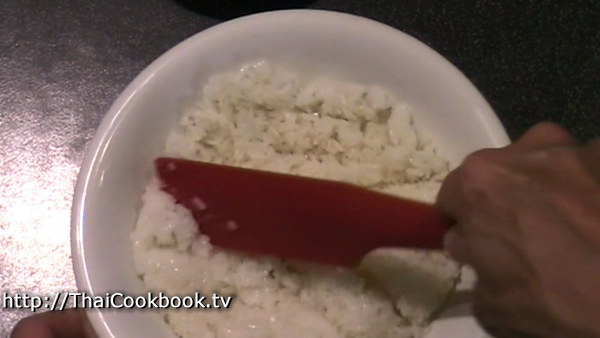 The secret to making it come out nice is to get as much of the coconut into the rice, while not getting it soggy. The rice should soak for at least 20 minutes, so now make the topping. For best results, leave the rice where it will stay nice and warm. In a small saucepan over low heat, blend the 1/2 cup coconut milk, 1/4 teaspoon salt, and 3 teaspoons sugar. When the sugar melt and the mixture starts to get hot, thin the starch with a little water and whisk it well to prevent clumps, then add it to the pan. Stir well and continue heating on low until the sauce thickens. Pour it into a small bowl and let it cool in the refrigerator. Use a small flat pan to toast the sesame seeds. It doesn't take long or much heat to get them golden brown, but for best results do it slowly and continue stirring them up by shaking the pan. Peel and cut the mango. One large mango is usually enough for 2 servings, but that's up to you. I usually use one side for each, then cut it straight across. You can be as decorative as you want, and you will see it cut may different ways. Put half the sweetened rice on a medium sized plate (warm is better). Lay the mango (cold is better) next to it. Sprinkle the rice with a little toasted sesame seed. Drizzle a little of the very cold sauce over it all. The sauce is sweet, but also salty, so you should not use too much. Garnish with mint if you have some.